Need some wheels for your robot or kid’s toy, but don’t want to spend the crazy prices or wait ages for delivery? 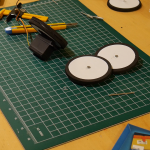 When I’m making robots and toys for my kids I am always gobsmacked at how much the wheels for toys cost. 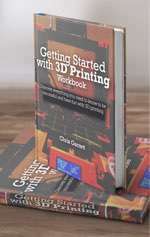 Seriously, for a smaller than 3″ piece of plastic, a few millimeters thick, prices like $7.00 to $15.00?!? 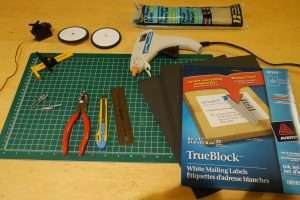 To keep rolling along on your projects, without sticker shock, follow the instructions below to make your wheels for pennies a piece. We are making two wheels this time so we will need 4 rivets. Two for the axels and two for the hubs. Take two of the rivets and using a pair of pliers lightly pinch the rivet portion and tap the nail or mandrel (the mandrel is the nail like object with a tiny ball on the end of it) out of the rivet so you are left with what looks like a tiny tall top hat, or the rivet. 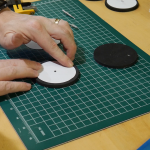 Take your foam and cut circles the diameter you want them to be, in this case, 3″ diameter as it works awesome for the bots we are building here at MakerHacks. 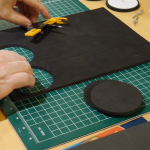 You will notice that the foam is bendy and will not make a good wheel on its own. That is what the next step is for. 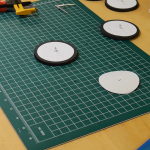 Cut the paper circles slightly smaller at 2.75″ diameter. 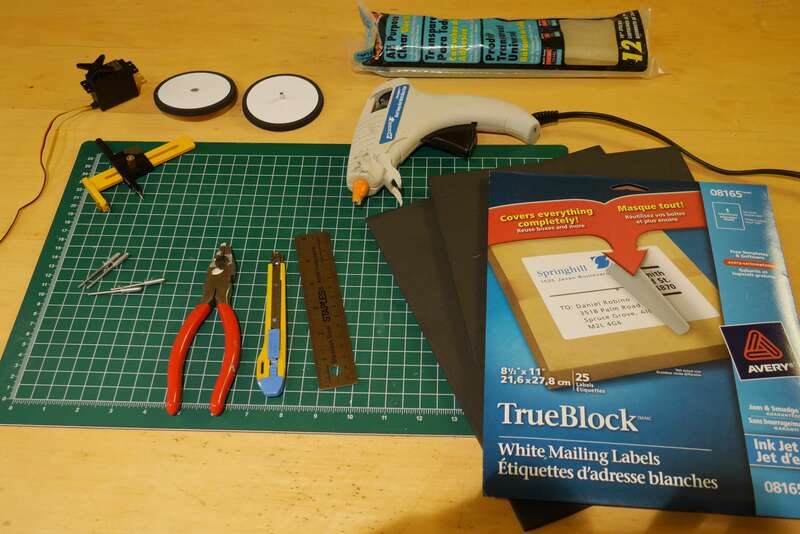 These will be attached to the foam and will stiffen them right up. 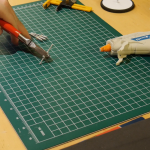 You will need to put one on each side to have this work properly but this effectively makes a composite structure like you would see in a F1 race car! Just slightly slower in this case. 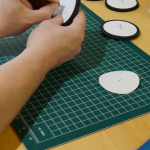 Place the cut paper circles on the foam wheels. 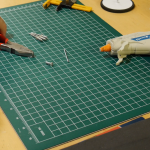 To make sure they are concentric, take one of the axel rivets and open up the center hole in the paper circles so they slide easily over the nail. Then press the nail through the foam and leave it there. 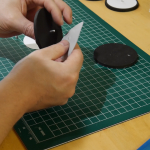 Remove the paper circle backing and place it adhesive side down onto the nail and slide it down onto the foam. 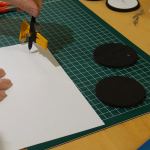 Do this on a flat surface and press the paper circle into the foam. 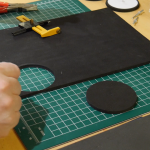 Next reverse the nail and place a paper circle on the other side of the foam wheel. 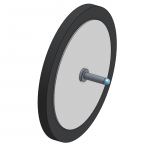 Now you can insert the nail from the two left over rivets into the wheel axel and you will see that it spins nicely. 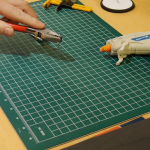 You can glue this axel into any toy or robot you want now! Freewheel wheels are not where we need to stop though. 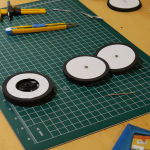 Robots need wheels that are powered. 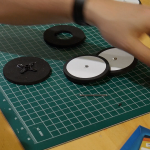 Attaching a servo horn from a continuous rotation servo to a wheel will be the trick we need. 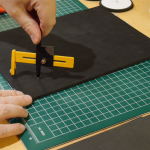 In this case, build a wheel as before but instead of putting in the axel rivet you glue on the servo horn. 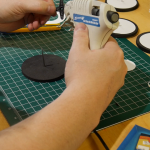 Use a nail through the foam wheel to align the servo horn to make it concentric to the wheel. Glue it down to your freshly made wheel. 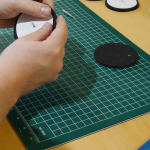 Cut one of the decal circles so that it clears the servo horn and attach it. 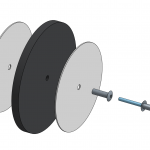 You will be able to easily push the servo horn screw into the center of the wheel and lock the servo horn down. 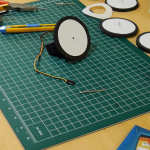 You now have a quick and super cheap motorized wheel for your projects! 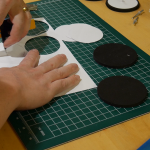 Cut out 2 foam disks like before. 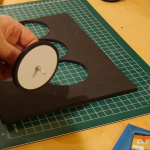 Cut out the center of one of the disks so that the servo horn can fit in. 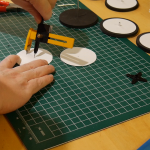 Cut out 2 paper decal disks. 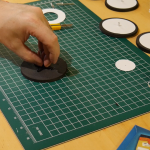 Cut one of the paper decal disks center out so you can clear the servo horn. 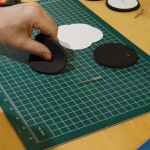 Place the full size paper decal on one side of the full size foam wheel. Then center up the servo horn using a nail through the wheel and glue it in. 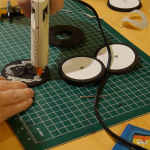 Carefully hot glue the two foam wheels together with the decal sides out. Make sure to keep the glue from the edge of the wheels so you don’t end up with glue oozing out of the edge of the wheel. 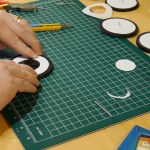 Place the cut out wheel and the cut out paper together. Attach your new wheel to the servo. 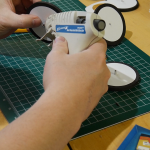 You will be able to easily push the servo horn screw into the center of the wheel and lock the servo horn down. Voila! 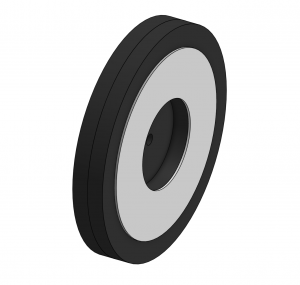 A nice chunky wheel for your robot! 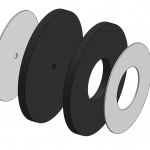 Should you want to attach one of these wheels to a stepper motor or a DC motor we have had success substituting the rivet hub with 1/4″ nylon tubing as a press fit onto the stepper shaft. I’m sure you could find tubing that will press fit onto any motor axel. All you need to do is not use a rivet for the axel and just glue the tubing into the center hole of the wheel you have just made. 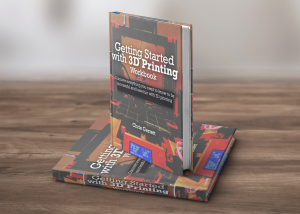 Another added bonus is that you can get foam in a ton of colors and the paper decals you can put through the printer to put your logo on or give them a splash of color as well. Join us on our Facebook group to discuss this. Show us how you have used these foamie wheels!